As style-focused consumers, we walk a fine line between what's currently trending and what will stand the test of time. Especially at this point in history. We are flooded with so. many. beautiful images of cutting edge design on Pinterest, Instagram, Houzz, TV and shelter magazines. It's hard not to get caught up in it and fall prey to the look of the moment. Today we'll have a look at a sofa I think will look good 20 years from now and will fit right in with whatever is trending in the design world. It's the English Roll Arm Sofa. This would have to be my top pick for favorite sofas of all time. It's uber classic and yet it holds its own in modern settings too. Not too feminine and not too masculine, the English roll arm looks great done up in solid fabrics (linen or velvet are top choices). Above is the Glenlee sofa from Anthropologie. Note the turned legs on casters and tight back. This is an English roll arm in its purest form! Are you more of a risk taker? Never met a pattern you didn't like? No worries! The English roll arm has you covered. Photo above, note how well our traditional English roll arm mixes with the more modern companions. 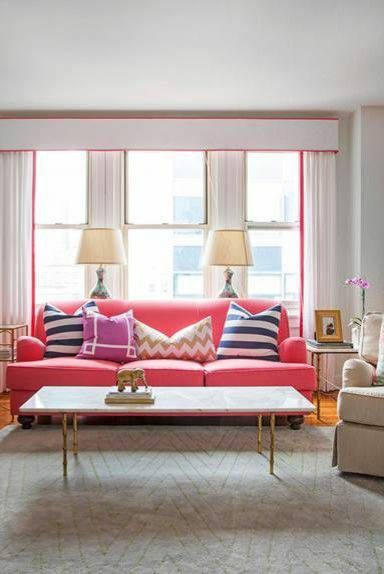 How I adore a colorful, eclectic mix like this - perfection! Do you like your English roll arm a little quieter? Fear not. Here's a slipcovered version that is relaxed and understated. This is the Brampton sofa from the Robin Bruce collection by Rowe Furniture. It's American made, extremely comfortable and well priced. To further entice you, a nice selection of fabric options are available (including crypton). Mommies rejoice! This is the Telford sofa from CR Laine upholstered in a fun and fabulous yellow zebra fabric. YOLO. From Baker, the "Elements Long Sofa".